Jack's tummy always rumbled with hunger. He could never get enough to eat. "I want more than berries and nuts and seeds. Bears are supposed to eat fish and honey, but I want something different." A delicious smell floated his way. "Oh, what is that smell? It smells good to me." He went to one of the nearby cabins and peeked out from behind a tree. "I can't let anyone see me. People are afraid of bears." A while later the people left to go to the lake for a swim. Luckily for Jack they left a loaf of hot bread on the table. He lifted the window and went inside, took the bread and ran into the woods. "This is good. I love bread." He ate every last crumb. He came upon another cabin. When he peeked in the window he saw that it was empty. The door was unlocked so he went inside. A pot of beef stew bubbled away on the stove. He turned off the stove and took the pot into the woods and ate every last bite. When he was finished, he took the empty pot back and left it on the doorstep. Some of the people complained to the park rangers about all the missing food. Ranger Bill went to some of the bears and asked them if they were sneaking into the cabins and stealing food. When he asked Jack, he lied and said it wasn't him. Ranger Bill saw crumbs on the ground near Jack's feet. "I see. Thank you Jack." Ranger Bill nodded and left. A golden brown crusted plum pie sat on a window ledge. The aroma carried through the air to Jack. "Oh, what's that smell? It smells like," he sniffed, "pie. I love pie." He crept to the cabin and took the plum pie from the window, ran into the woods and sat down on the ground to eat it. He stuck his fingers in and licked the plum filling off. "This is so good." Later that day Ranger Bill came back into the woods and asked the bears if they'd eaten a pie. They all said no. The ranger snuck up on Jack and saw him eating the pie. "Ah ha. It is Jack. Just as I thought." He coughed to let Jack know he was there. Jack heard Ranger Bill's cough and hid the pie behind a wooden crate. "Hello, Ranger Bill. How can I help you?" "It seems that a bear has been taking pies from the cabins, and stew, and bread and cakes and anything else he can find. Would you happen to know who that bear is, Jack?" Jack shook his head back and forth. "I don't know, Ranger Bill." "Can I see your paws, Jack?" Ranger Bill waited for the bear to show him. Jack held them out. Purple stains covered one of the fingers. "That finger's awfully purple, Jack. It almost looks like you'd been sticking it in a plum pie." The Ranger tapped his foot on the ground. Jack was about to lie again, but saw how angry Ranger Bill looked. Instead, he cried. "I'm sorry. I was so hungry. I get so tired of eating nuts and berries. I just wanted something good to eat." Ranger Bill sat down next to Jack. "Jack, you are a bear. 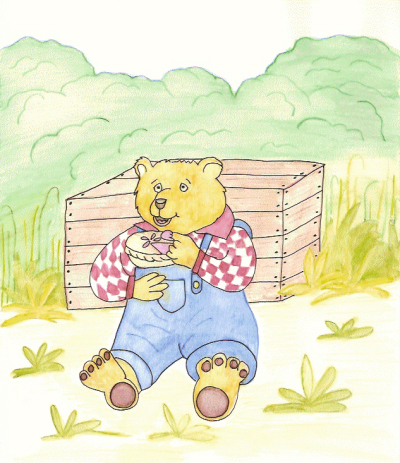 Bears aren't supposed to eat pies and bread and beef stew. I'll tell you what. You go down to the river and catch some fish and then gather some berries and nuts and bring them to the Ranger cabin. I'll make you a fish supper and berry-nut pie. Would you like that?" Jack smiled. He stood and ran around in circles. Reaching behind the crate, he pulled out the half-eaten plum pie. "You'd better take this back." He handed it to Ranger Bill. Ranger Bill let Jack finish the pie and that night the bear showed up with three fish and a paw full of berries and nuts. As promised, Ranger Bill fixed Jack a fish supper and a berry-nut pie. Every night from then on he cooked supper for the bear. As long as the bear did his part and left the cabins alone and caught his own fish, picked his own berries and gathered his own honey, Ranger Bill was happy to fix it for him. Jack was a much happier bear.